Today is the day! After learning how to prepare and insert the bobbin, thread your machine, and the basics about stitch length and width, you’re going to sew! 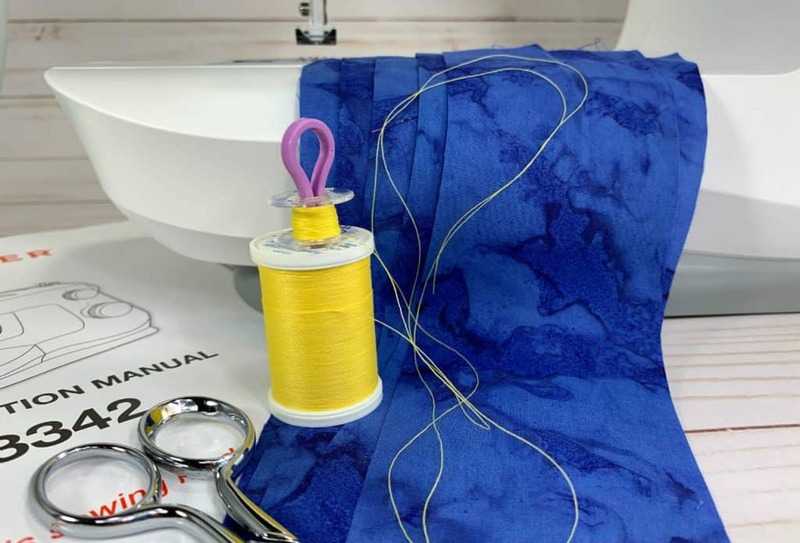 There are two basic stitches you need to know as you begin your sewing adventures…the straight stitch and the zig-zag stitch. A sampler of both straight and zig-zag stitches. Because there are so many different sewing machines, it’s impossible to share with you specific details about sewing on your machine. 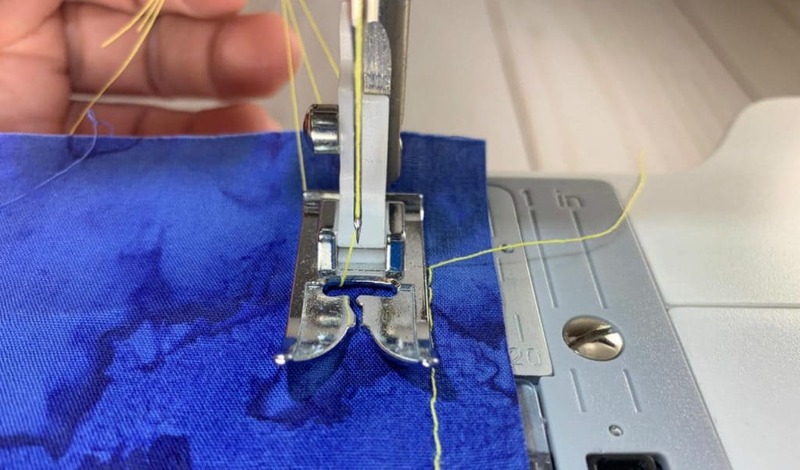 The goal of this post is to provide a framework so you understand the basics of sewing straight and zig-zag stitches regardless of the brand and model of your sewing machine. 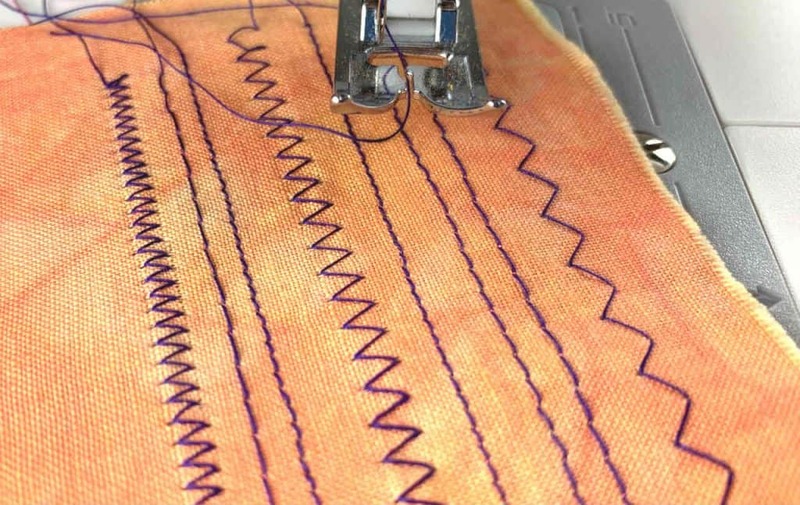 Now that you have an understanding of sewing machine stitches, let’s focus on two basic stitches you’ll sew today: the straight stitch and the zig-zag stitch. The straight stitch is the most common type of stitch. You use the straight stitch in almost every project. A sampler of the straight stitch with stitches increasing in length. Sewing techniques are another factor to consider when you’re making a decision on stitch length. 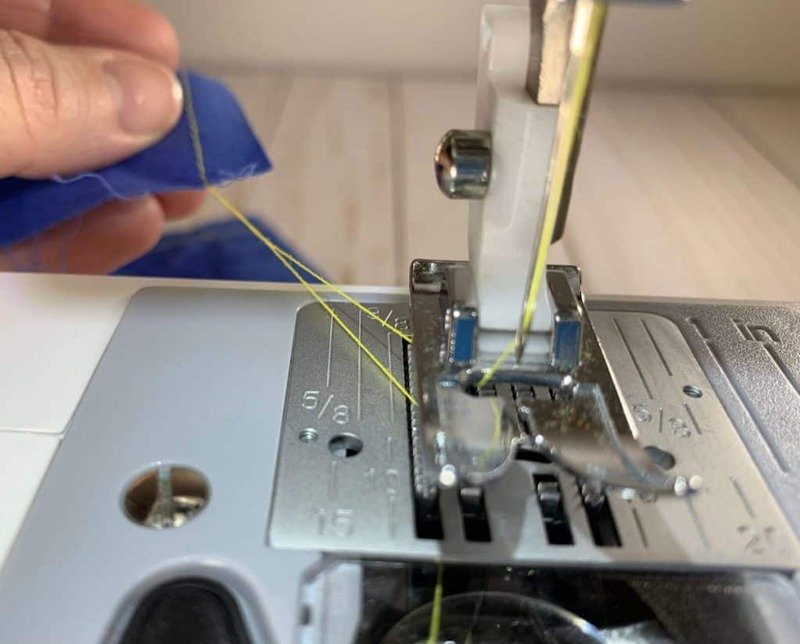 For example, if you’re sewing slippery fabrics together, you could first sew a basting stitch, a temporary stitch with a long length, before sewing the regular seam with a shorter stitch. Basting stitches are also used to gather material. In either situation, the basting stitch is easily removed because of its long length. The straight stitch is sewn with a stitch width of 0 (zero). When adjusting the stitch width, the needle must NOT be in the fabric. Your sewing machine may have a needle position dial in addition to the stitch width dial. If you’re using the measurements that are imprinted on the needle plate for a specific seam allowance, you need to make sure the needle is positioned in the center. There may be a time when you aren’t using the seam allowance measurements and want the needle off center. If this is ever the case, you would change the stitch width if your machine doesn’t have a needle position dial. It’s a good idea to try out the zig-zag stitch on a scrap piece of fabric before you use it in a project. That way you can get the correct stitch length and width for the appearance and purpose you want. A sampler of zig-zag stitches all with a length of 4 and widths ranging from 1-6 going left to right. 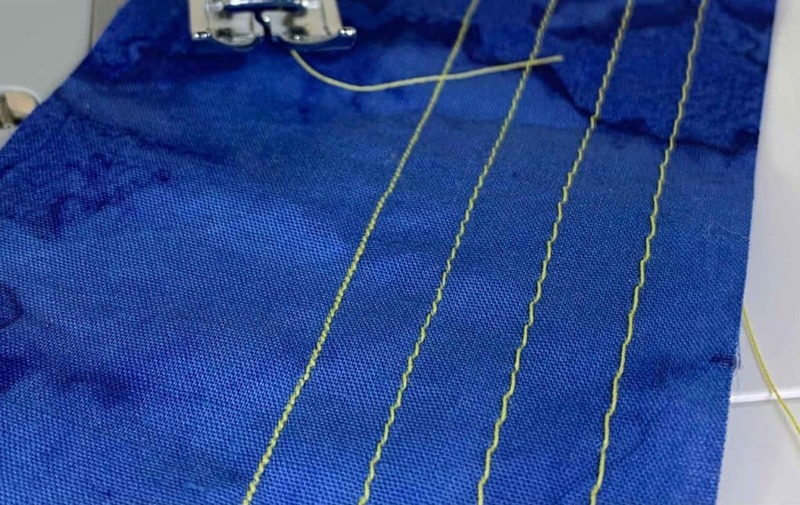 The reason you’re using a zig-zag stitch will help you determine the stitch length you need. For example, a buttonhole needs a short stitch length and an applique stitch would need a longer one. A short stitch length makes the zig-zag look squished together. A longer stitch length makes the zig-zag look more spread out. The reason you’re using a zig-zag stitch will help you determine the stitch width you need, too. On a zig-zag stitch, the needle will go left to right as it moves up and down. When you adjust the stitch width, you change the distance the needle travels left to right. Get your sewing machine out and set it on the table in front of you. Plug it in. Have the instruction manual* and scissors next to your sewing machine. Thread your machine with light colored thread and insert a bobbin of the same color. Check the instruction manual for the presser foot you’ll need for the straight and zig-zag stitches. Most likely it will be the all-purpose presser foot (may also be called standard or ordinary presser foot) for both stitches. Cut 5-6 scraps of fabric that are about 3 inches wide and 12 inches long that contrast with the thread. Your needle is secure and raised to the highest position. Your stitch selection is set to straight stitch. The stitch length is set to the longest stitch (the greatest number). Stitch width is set to zero. This is the moment you’ve been waiting for … it’s time to sew fabric on your sewing machine! You won’t be sewing fabric pieces together. 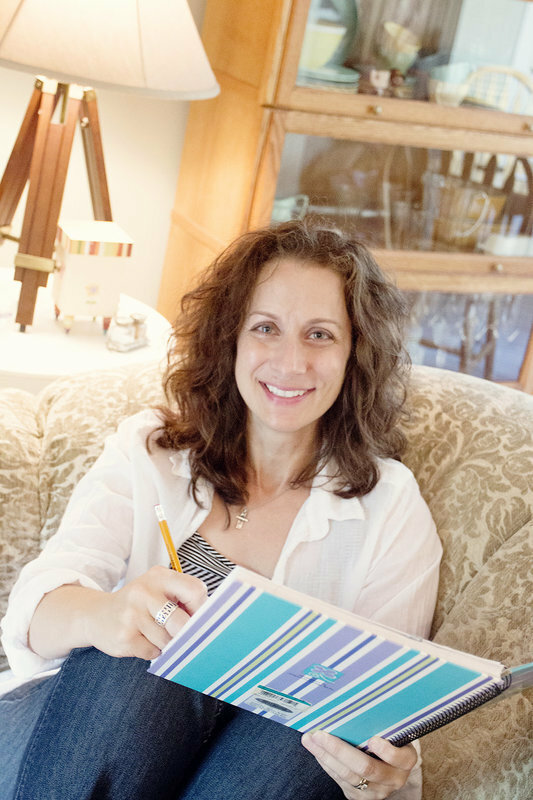 Instead, you’ll use one piece of 3″ x 12″ fabric at a time to create several samplers, pieces of fabric that demonstrate what you’re learning about straight and zig-zag stitches. Because stitch length and stitch width are key factors in forming the two most basic stitches, you’re going to have time to experiment with them when you create the samplers. Practice sewing the straight and the zig-zag stitches. Notice how the stitches change when you adjust stitch length and width. Get comfortable with how the fabric feels as it moves through the machine when you press and release the foot control. 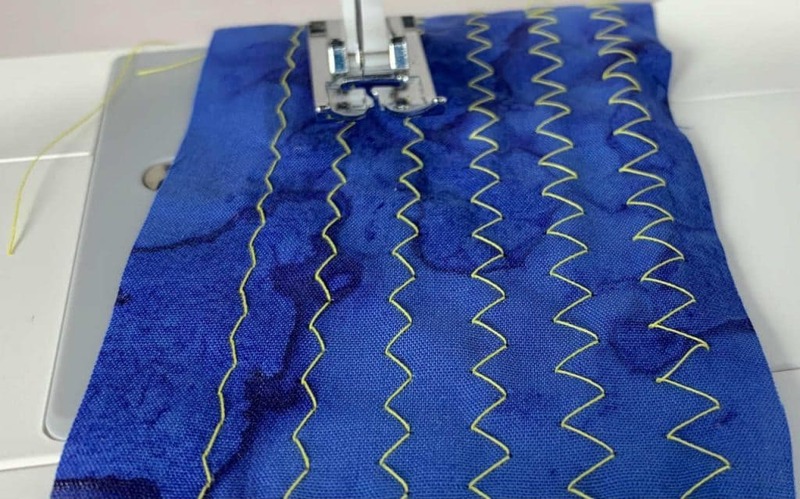 The light colored thread and contrasting fabric allow you to easily see the changes in your stitches as you adjust the stitch length and width for both the straight stitch and the zig-zag stitches. Lift the presser foot and pull both the upper and bobbin threads to the back of the machine. Both threads should be under and behind the presser foot. Place the fabric underneath the lifted presser foot. Line the right edge of the fabric on the right edge of the presser foot. The needle should be about 1 inch in front of the top edge of the fabric. Lower the presser foot. Hold the threads behind the sewing machine with your left hand so they don’t get caught under the fabric. Put your right hand lightly on the fabric about 2-4 inches in front of the presser foot. You will use your right hand to guide the fabric once you start sewing and keep the edge of the fabric lined up with the edge of the presser foot. You control the speed of the needle. Press slowly but firmly on the foot control until the needle starts to move. Work to keep the needle moving at a steady pace. Let go of the thread in your left hand once you’ve gone a few stitches. Now, put your left hand on the fabric to the left of the presser foot. You will use this hand to control the fabric as it moves through the machine. Use your right hand to guide the fabric. Do not watch the needle. Keep your eye on the right edge of the fabric that’s lined up with the right edge of the presser foot. This will help you sew in a straight line. Stop sewing just past the edge of the fabric by raising your foot of the control. Gently pull the fabric toward the back of the sewing machine until the thread length is about four to five inches. Clip the thread close to the fabric. Place the fabric back under the presser foot. Line up the right edge of the presser foot with the stitch line you just sewed. Change the stitch length by moving it down one number. Press steadily on the foot control and sew another line. Remember, don’t watch the needle. Keep your eye on the right edge of the presser foot next to the first line you sewed. This will help you sew in a straight line. Repeat steps 2-12 until you have sewn with all stitch lengths. Examine the straight stitch sampler. The decreasing (or increasing depending on what way you are holding the sampler) length in the stitches on each row should be noticeable. Look carefully at the stitches on both sides of the fabric. Neither the needle thread nor the bobbin thread should be too loose or too tight. The stitches they make together should be just right. The stitching is just right if the needle thread is on the top of the fabric and the bobbin thread is on the bottom. Just right stitching means the stitches are well-balanced and the tension is good on your machine. There also isn’t any pulling or puckering on the fabric. For more information on tension and how to achieve well-balanced stitches, refer to your sewing manual. Look for the thread tension dial as one of the labeled parts of the sewing machine at the front of the manual. Also, check the table of contents for thread tension. Additional information may also be included in the troubleshooting section of the instruction manual. Get a fresh scrap of fabric. Make sure the needle is in its highest position by turning the handwheel toward you. Set the stitch selector to the zig-zag stitch. Move the stitch length to 4 (or the highest number). Move the stitch width to 4 (or the highest number). Keep the stitch length the same but turn the stitch width down one number. Make sure the upper and bobbin threads are under the presser foot and behind the machine before you sew. Before you press on the foot control, hold the threads to keep them from getting caught underneath the fabric. Repeat steps 6-21 until you have sewn rows of zig-zags with the same length but decreasing widths. You’re sewing! Now that you know how to make two basic sewing machine stitches, take a little time to play around with them and create more samplers. Experiment with stitch length and width while using both the straight and zig-zag stitches. Randomly change stitch length and width to see what effects you create. When you change the stitch width, notice how the position of the needle changes and what that allows you to do. Remember, never adjust stitch width when the needle is in the fabric. 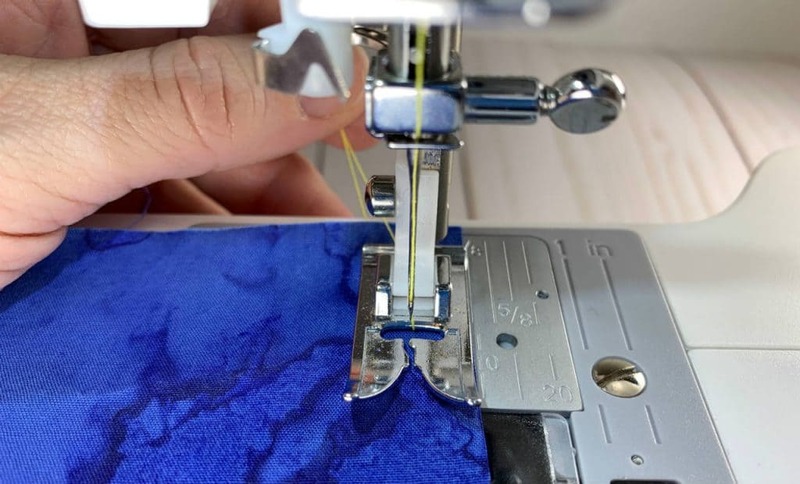 Tip – Get in the habit of making sure the needle is in its highest position (by turning the handwheel toward you) whenever you start and stop sewing as well as when you change stitch length and width. If you’re feeling really adventurous, see the changes that happen if you adjust the tension. Refer to the instructional manual for details about thread tension and your sewing machine. 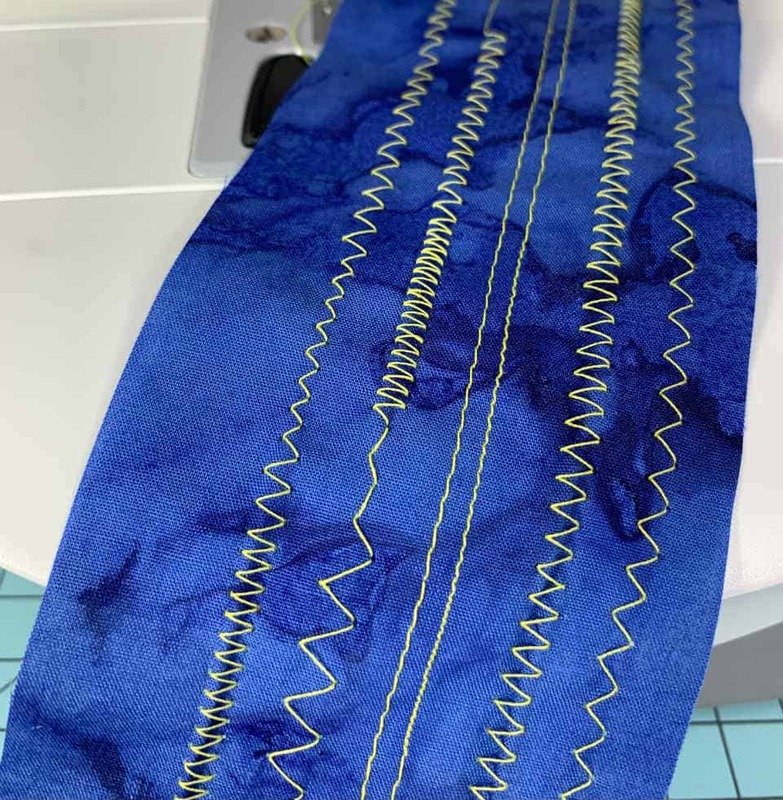 You’ve had the opportunity to learn about your machine and experiment with stitch length and width while sewing straight and zigzag stitches. Now, let’s talk about 8 sewing basics you need to know.